In this generally excellent article republished via Pravmir (first published here by The Huffington Post) on the Fall of Constantinople’s extraordinary significance in Orthodox Christian, Muslim and Western history, as well as Greek and Turkish national identity, Dr Elizabeth H. Prodromou and Dr Alexandros K. Kyrou connect the legacy of May 29, 1453 to the continuing marginalization and persecution which Christians endure in Turkey. The Middle East’s only republic to have a predominantly Muslim population while still adhering to an officially secular Constitution, Turkey has seen a period of increasing pressure on Christians as the currently embattled Prime Minister Recep Tayyip Erdoğan and his ruling AKP party have sought for several years to realign Turkey, an emerging regional power, with neighboring Muslim countries. As a result, Erdoğan practices a kind of Islamist populism which selectively blends Turkish nationalism with a consciously Muslim identity and the occasional politically timed pan-Arabism quip. Turkish PM Erdogan has recently expressed his support for the possible re-converting of Hagia Sophia (Turkish: Ayasofya, Greek: Ἁγία Σοφία), currently open to the public as a museum, into an active mosque. 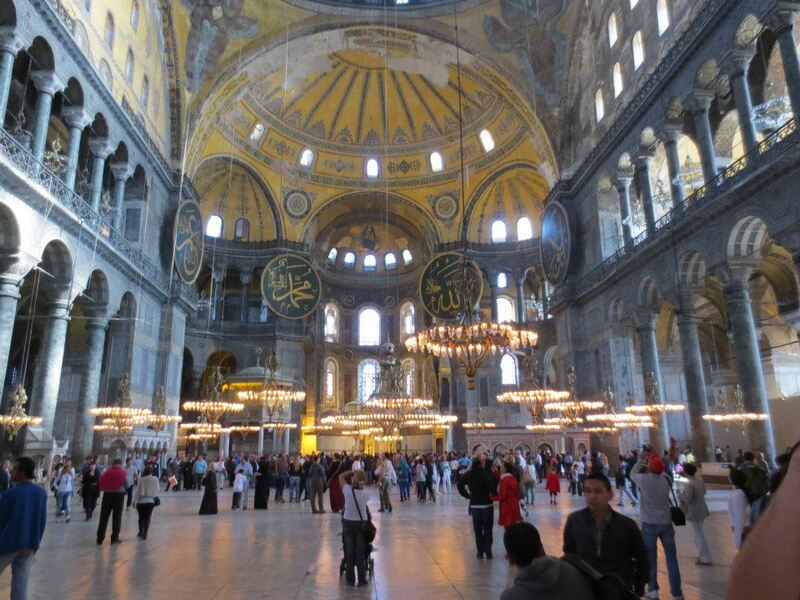 Besides angering Christians worldwide, this affront to Istanbul’s shrinking Greek Orthodox community based in the Phanar, the headquarters of the Ecumenical Patriarchate, would also mean the loss of significant revenue from tourists, especially many Christians, who visit Hagia Sophia ever year. The authors of this piece are outstanding experts in the field of modern Turkish and Balkan politics, Eastern European history, and the status of the Orthodox Church in the Middle East and Southeast Europe. Dr. Prodromou is an Affiliate Scholar at the Center for European Studies at Harvard University where she serves as Co-Chair of the Southeastern Europe Study Group. She is also a retired US diplomat as the former Vice Chair of the US Commission on International Religious Freedom. Dr. Alexandros K. Kyrou is Associate Professor of History at Salem State University, where he directs the Program in East European and Russian Studies and teaches on Byzantium, the Balkans, and the Ottoman Empire. 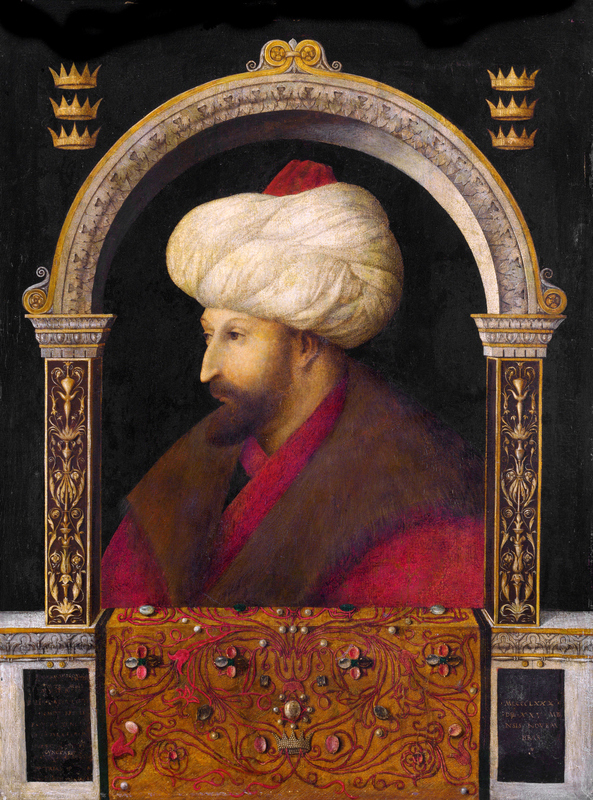 The Venetian painter Gentile Bellini (1429-1507), official painter to the Doges of Venice, rendered this portrait of Ottoman Sultan Mehmed II Fetih (“the Conqueror”). 1) “When the Ottomans began their 54-day siege of Constantinople, the city was still renowned throughout Europe for its size, wealth, and cosmopolitan sophistication”. (Emphasis mine). Unless Drs. Prodromou and Kyrou use the word “size” here to refer to the sheer territorial extent of the city, which did cover a large area of the European side of the Bosporus, then it refers to the city’s population. Yet by 1453, the once-massive city had shrunk to a shell of its former metropolis-level population. By some contemporary accounts, Constantinople’s population had approached either half a million souls in the sixth century, reaching possibly as high as 800,000 in the twelfth (the city was never quite so large as Classical Old Rome with its over 1 million souls). By 1453, estimates from both Byzantine and Venetian sources put the total population of the city at figures as low as 40,000 souls. By then, Constantinople had been reduced to a veritable city-state in its actual territorial sovereignty, while still an Empire from a political theory perspective. When Mehmed II rose on horseback through the conquered Second Rome, he rode through what must have appeared to him a desolate landscape of burning settlements, small villages loosely connected by the ancient roads and viaducts which had once served as the arteries of the city in its heyday as a global metropolis. I understand that this is a summary intended for a general readership, but I have two points with this sentence. Firstly, it is historically inaccurate to posit that “Constantinople’s Christians were largely alone when the Ottoman Turks began their assault on the city”. 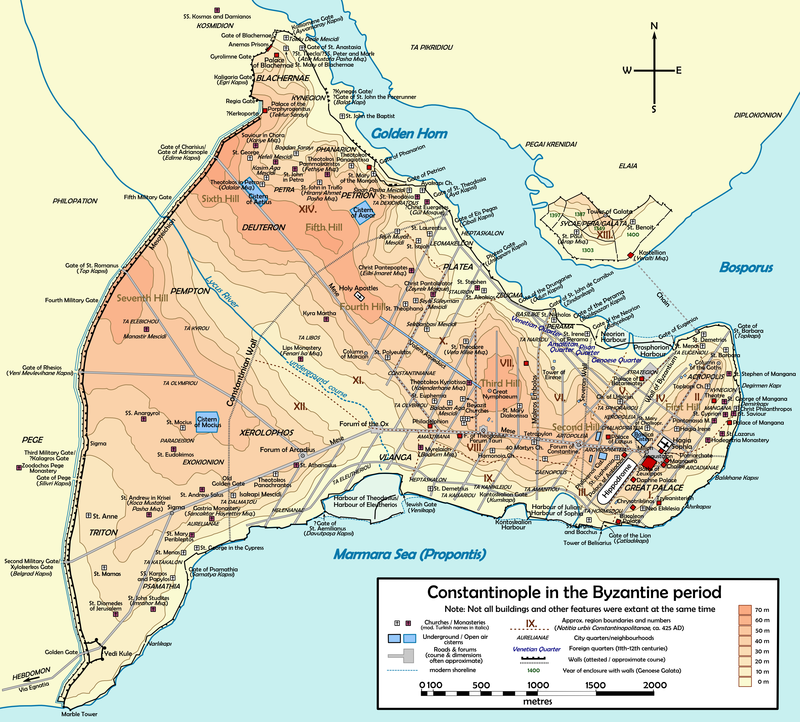 Out of a total defense force of at most 6-7,000 men (according to almost all contemporary sources), a body of at least 700 Genoan and Venetian troops defended the city alongside the Byzantines, with many perishing alongside Emperor Constantine XI and some witnessing the city’s brutal three day sack. 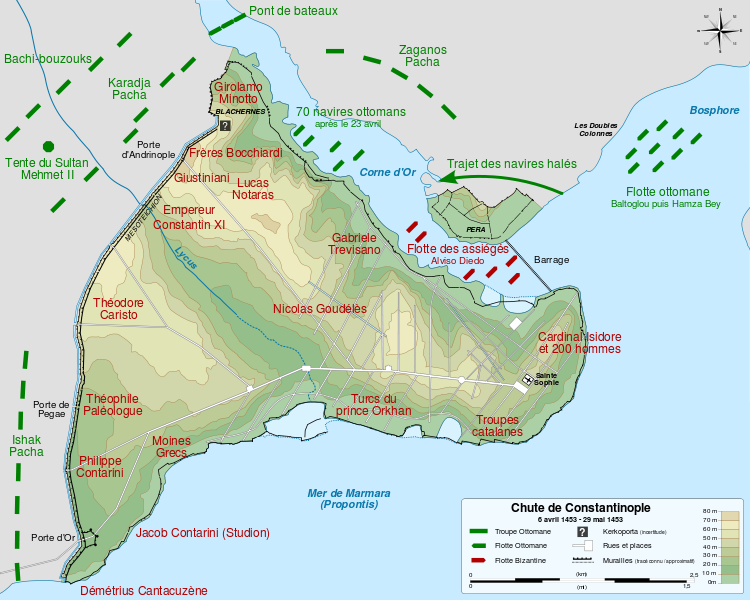 This map in French gives an approximation of the Venetian and Genoan positions on the walls of Constantinople during their defense of the city alongside the Byzantines. Thus, the historical reality is that at least one-tenth of Constantinople’s defenders were mercenaries from the northern Italian mercantile city-states which had previously been great (and largely successful) rivals to the Byzantines, whose fortunes had reduced considerably after the Fourth Crusade ended with the sack of Constantinople in 1204. The circumstances which caused the Fourth Crusade to end as it did are extremely complex, but what historians agree on is that Enrico Dandolo, the Doge of Venice approved the sack against Pope Innocent III’s orders since the Venetian forces had not been paid what Emperor Alexios IV had promised them for their support against his rivals Alexios III and Isaac II, Alexios IV’s own father. So, while it is accurate to say that no Western kingdoms sent any substantive aid to assist the Second Rome (France and England were largely exhausted from fighting each other in the Hundred Years’ War, while Castile and Aragon were focused on the Reconquista of the Iberian peninsula from the remaining Muslim city-states and were not yet united in personal union under Isabel I and Fernando II), it is misleading to say that “Constantinople’s Christians were largely alone” in 1453 when at least one-tenth of the city’s defenders were Catholic soldiers sworn to the capital’s defense. The restored fourth century Theodosian Walls commissioned by St. Emperor Theodosius I (347-395, r. 379-395 as Byzantine Empire, from 392 over reunited West and East). 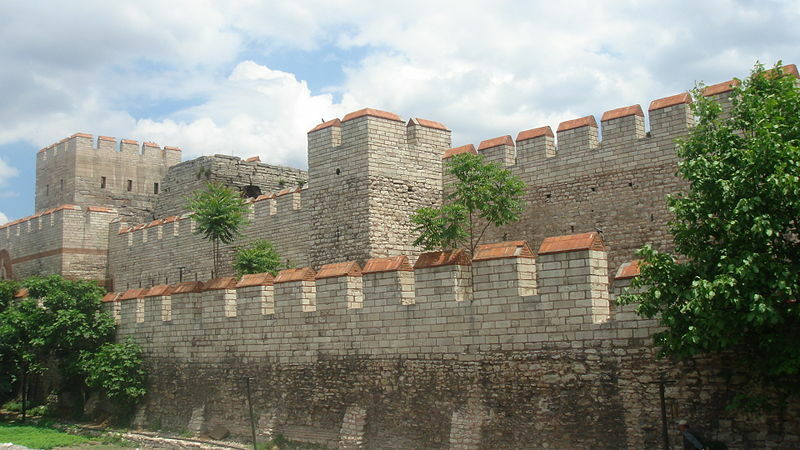 Prior to the 1453 siege which involved the terrifying use of massive bombards (huge, cumbersome siege cannons) by Mehmed II’s forces, these walls were believed to be impregnable. Secondly, when referring to the Great Schism of 1054, this sentence is very reductionist, in the sense that the Schism was an accident of political and ecclesiastical history which did not alter the ecclesiastical reality of intercommunion between the Churches of Old and New Rome for many years. In reality, historical evidence suggests that Western Christians under the sole Western patriarch, the Bishop of Rome, and those Eastern Christians living under the jurisdiction of the Byzantine Patriarch of Constantinople continued to inter-commune following 1054. The Great Schism dated to that year only occurred because the two main protagonists, Cardinal Humbert, the papal legate to Constantinople, and Byzantine Patriarch Michael Cerularius (Greek: Keroularios) mutually antagonized each other, exchanging shared insults contrary to the spirit of Christian love and fraternity in which they were supposed to meet. 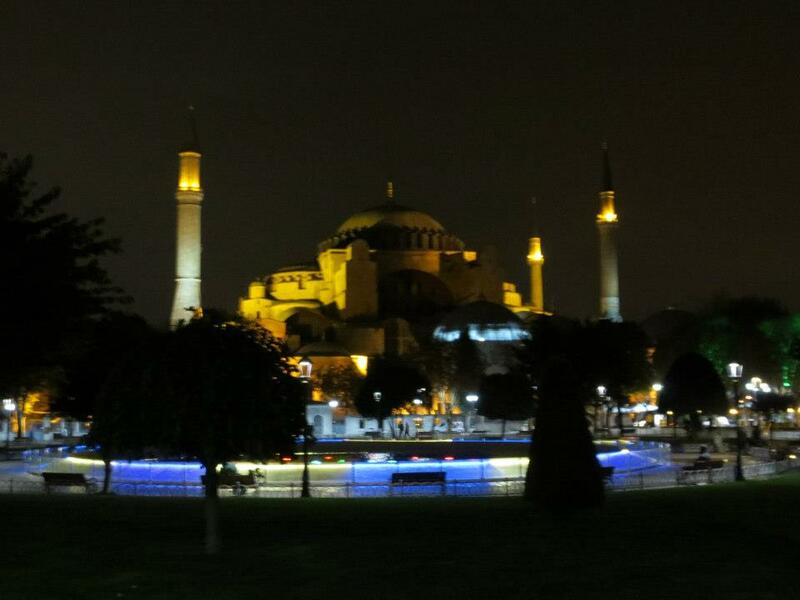 Hagia Sophia at night, as it appears today. Upon his conquest of Constantinople, Mehmed II converted Hagia Sophia into a mosque to symbolize the conquest of the ancient heart of Byzantine Christianity and Islam’s superseding of Orthodox Christianity in the Eastern Mediterranean. Mehmed also took upon himself the title “Caesar of the Romans” (Ottoman Turkish: Kayser-i-Rûm), believing that the mantle of the Classical, then Christian Roman Empire which Byzantium had preserved for a millennium had fallen to him, the ruler of much of the Muslim world. Mehmed’s claim, rejected by the Grand Duchy of Moscow and the Holy Roman Empire which both claimed to be the true successor to Constantine’s city, rested with the concept that Constantinople was the seat of the Roman Empire, after the transfer of its capital to Constantinople in 330. 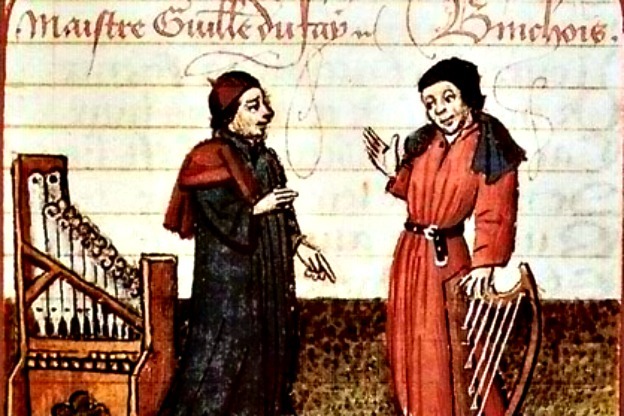 According to Roman canon law, Humbert had no authority to excommunicate the Patriarch of Constantinople unless specifically authorized by the Roman Pontiff, who never so authorized him. In fact, Leo IX, the Pope who had sent Cardinal Humbert to treat with Patriarch Michael, was dead at the moment Humbert laid the bull upon the altar of Hagia Sophia to the horror of the assembled clergy, Eastern and Western. Thus, from the perspective of the Roman canons, a papal legate to a dead Pope has no authority to issue any previously signed bull of excommunication from that pope (never mind that Leo had never drawn up a bull or authorized Humbert to do this). Looking toward the eastern apse which rises above where the altar and silver iconostasis once stood, you can see the architecturally odd arrangement left in the wake of Mehmed’s conversion of the Orthodox temple into a mosque. 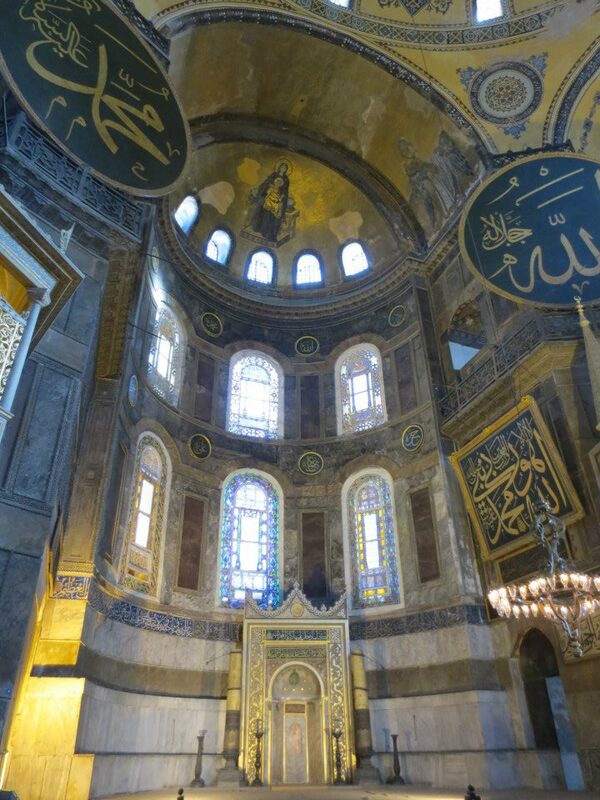 Mehmed had the magnificent Byzantine frescoes painted over (fortunately he did not have them destroyed) and ordered four pendants bearing the name of the first four Muslim caliphs (political and spiritual leaders of the Ummah, the Muslim community) recognized in the Sunni tradition erected to hang over the nave. On Mehmed II’s orders, the Christian altar was removed and in its place a mihrab erected. This niche in the wall indicates the qibla, the direction toward the Kaaba in Mecca. As you can see, this is obviously aesthetically off-center, as the building was clearly designed to face cardinally east.